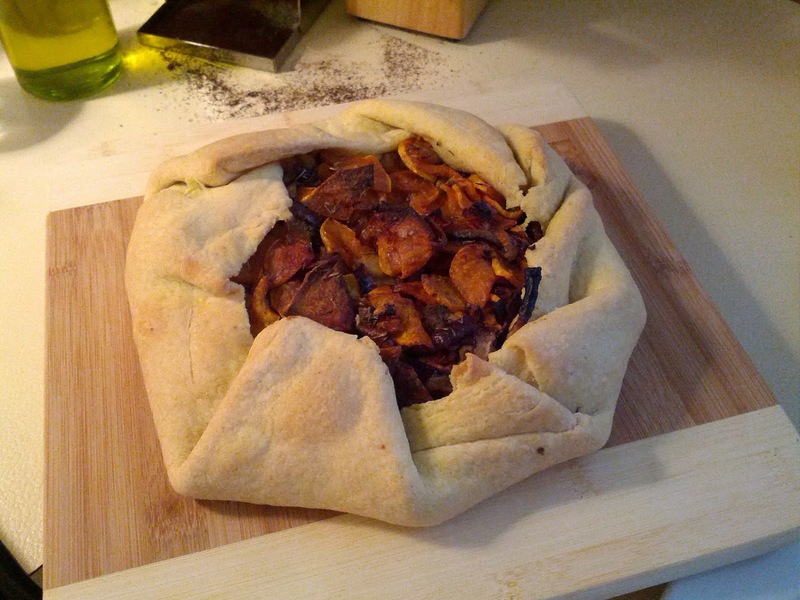 I wanted to make another savoury pie this weekend and decided to try to make a vegetable pie. That's a bit of a challenge for me because I'm not known for my love of chunky vegetable things (ratatouille, for example, is not something I'm very fond of). This pie jumped out at me as I was randomly wandering the Internet looking for inspiration. It's an adaptation of this recipe. Make the pastry. The rest of the preparation should give it just enough time to chill. Pre-heat the oven to 225º C and line two baking sheets with foil or baking paper. Peel, de-seed and slice the pumpkin flesh thinly. Coat with a bit of olive oil, some salt and the thyme and spread out onto a baking tray. Coat the onion with some oil and salt, and spread it into a single layer on the second tray. Roast the vegetables for 20 minutes. Roll out the pastry to make a large circle slightly larger than the tray you'll be using to bake the pie. Crumble the cheese onto the pastry leaving a 4cm border. Sprinkle the nut pieces over the cheese and the spread the pumpkin and onion mix over the top of that. Fold the 4cm overlap into the centre and bake for 40-50 minutes. Slightly longer because of the folds, but don't overcook the filling. I modified the recipe I found at the link by using my simpler pastry. I also altered the vegetable cooking time as the instructions were unclear and my pumpkin ended up a little overcooked. Because of this I ended up not cooking the pie for quite long enough and some of the pastry was undercooked. I also used 100g less of the nuts than the linked recipe as I'm not a big fan of walnuts and I couldn't find pecans.